This is the first moth I have successfully reared from an egg: Acronicta vinnula. So exciting! Though of course I had to pin it as a voucher, so its lifespan as an adult was short… that is the fate that awaits all of the moths that hatch from my research. By pinning and measuring them I can determine if my rearing conditions are satisfactory – if they are not, the adults will be stunted (shorter fore-wing lengths) compared to wild caught specimens. I can’t wait for more adults to start emerging! I have fallen behind with giving larval updates… I already have pupae of A. americana, A. oblinita, A. vinnula, A. falcula, A. hasta, Comachara cadburyi and Polygrammate hebraeicum. I have a bunch more species as young larvae, and a few females I’m waiting to lay eggs for me. Did some collecting last night which was a blast, I will describe that adventure soon. 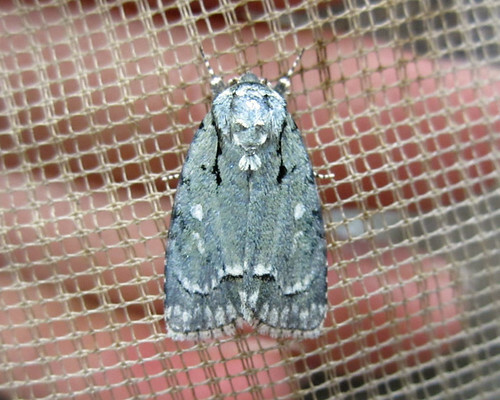 Posted on July 22, 2011, in Acronicta, Acronictinae, Invertebrates, Lepidoptera, Noctuidae. Bookmark the permalink. Leave a comment.